How do you describe your lab to visitors? The Studio for Critical Making at Emily Carr University of Art and Design is a research facility that explores how humanities-based modes of critical inquiry—like the arts and ethics—can be directly applied to building more engaging information technologies and speculative objects. The lab works to replace the traditional engineering goals of efficiency, speed, or usability with more complex cultural, social, and human-oriented values. The end result is technology that is more culturally relevant, socially engaged, and personalized. What is a unique feature of your lab? The space is currently housed in a storefront-style space on Granville Island in Vancouver, which is a small, arts-oriented district of the city with many tourists. As a result, the space usually has tourists taking photographs of whatever is going on inside, like using tools, building circuits, or making things. It’s a bit like being a gorilla on display in a zoo, but I enjoy the public interface. How many people are in the lab, and what is the mix of backgrounds and roles? The lab opened a few months ago, so it currently operates as a studio to develop my personal technology-oriented studio projects. I currently work with four other part-time researchers: one researcher from computer science and three undergraduate students with backgrounds in industrial design, wearables, and film. Briefly describe a day in the life of your lab. I have a goal of making something physical each day and writing a piece of academic text each day, and my in-studio time usually revolves around trying to do both. It’s difficult to accomplish this every day. A small, useful tool to help do this is a one-hour kitchen-style timer; I pick a single task and set the timer for an hour, and try to work for the duration on finishing just one thing. A typical productive day involves coming in to the space, getting some writing done during the morning, submitting paperwork and answering emails around noon, then rewarding myself by making tea, turning on music, and sitting down and soldering something together or using power tools or making something in collaboration with somebody else. A good day usually includes bloody knuckles or grime under my fingernails. It’s a bit like being a gorilla on display in a zoo, but I enjoy the public interface. What is one feature of your lab that you could not do without? A water heater—I have a Zojirushi CV-DS40 VE—for making tea. It’s useful while writing, building, or meeting. It makes deadlines more attainable. How would you describe how people interact in your lab? I’ve taken effort to design a space that people want to hang out in and work in with a library of books, comfortable seating, some items on display, a screen that continuously showcases projects, some actual projects that are currently being developed or redesigned, and a selection of tools and equipment to help build things. 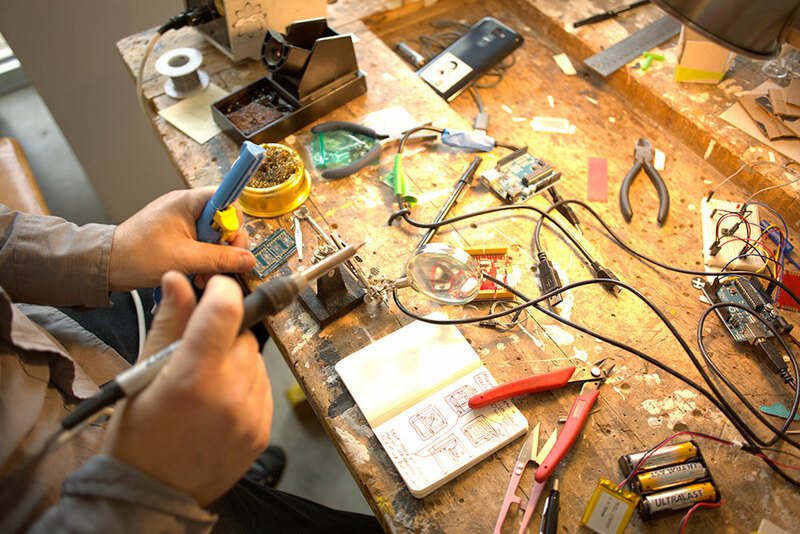 It’s part art studio, part hackerspace, and part university lab. If people comment that they’d like to work here, I generally invite them to come and work and collaborate. Students, colleagues, friends, and collaborators come and go throughout the day. What is the one thing you see as most important about the work you do there? I have a position as a Canada Research Chair, which is part of a national strategy to encourage excellence in research and development. Until now, these positions haven’t been awarded to art and design schools, and I see a large part of my agenda as figuring out what it means to do research through art and design. How does art or studio production generate knowledge? What exactly is design research? What are engaging alternate modes of peer review, knowledge production, technological innovation, or dissemination? What is research-creation? The fun part is that there is no clear path. To help figure this out, my first objective is to build engaging technology projects that provide opportunities for the public to critically reflect and explore society’s relationship to technology. To explore these questions, I aim to build “things to think with”—functional prototypes that are exhibited in public art galleries, documented online, and published as case studies in academic papers—to expose and explore the hidden assumptions and values embedded in technological systems. My second objective is to construct a solid framework and methodology for critically engaged technology design: one that offers both a theoretical foundation and practical instruction in how humanities-based inquiry can constructively impact how technologies are built.